On entering a cathedral, a tourist is often struck by the inherent harmony of the whole structure; a harmony which results from a well-defined design and successful proportions. He would not, at first, be aware that the edifice was the work of several generations of architects and stone-masons. His attention for details, evidence of a development of taste or techniques of successive generations, would only come later. That is the case as well with the French Psalter which in its completed form was published in 1562. At first glance it seems that it is of uniform construction; one psalm looks much the same as another. One could easily think that the words and music were put together at one and the same time. The unity is even so strong that, if the initials of the author were not given, it would be impossible to tell who was responsible for what versification. The same can be said for the melodies: they all look the same, their origin, however, is veiled in anonymity. It is indeed a unity: the Psalter of Geneva contains only versifications that remain faithful to the Biblical prose text. We do not find in them commentaries, paraphrases nor meditations inspired by a certain passage. Neither do we find attempts to actualize them, as can be found in German hymns of the same period. In the Psalter, that strove for the greatest possible faithfulness to "Hebraic truth", such elements would create the impression of pure human additions, which would open the door to dangerous inventions. The faithfulness to the Bible text is, however, a faithfulness of the second degree. Neither Marot nor de Beza rhymed the Psalms from the Hebrew text. Both used a French translation, which, although not directly translated from the Hebrew language, refers to the truth expressed in the Hebrew text [Pidoux refers to Olivétan's French bible of 1535]. Indeed when Marot rhymed the first psalm, he indicated what one of his sources was, perhaps it was the most important source for a series of his rhyming [this is too quickly inferred]. In following the Bible translation of Olivétan of 1535 he uses the term "the Eternal" (l’Éternel) for the holy tetragram (the four consonants j-h-w-h with which God's name was indicated in Hebrew). Beza followed the Genevan translation, revised by Loys Budé, step by step. In order to sing the Psalms it was necessary to divide the material in regularly recurring strophes, composed of short lines with its tyrannical rhyme-scheme. In spite of this straight jacket the Biblical substratum, however, is directly discernable. It even happens that the prose texts are quoted literally in the versifications. Calvin is accused of having had a deep-rooted enmity of all artistic creations, yet it has to be acknowledged that he had a deciding influence on the realization of the Genevan Psalter. From the small collection published in Strasbourg in 1539, via all the Genevan phases 1542, 1543, 1551, to its completion (in 1562), Calvin was personally busy with it, as initiator and as defender of the interests of the poets and musicians. The oldest text concerning the singing of the psalms "with the sermon" dates from 1537. The ministers asked the Council for permission for this novelty. The text and style can only have been written by Calvin. The singing of psalms, he says: "can arouse us to lift up our hearts to God and move us to an ardour both to call upon and to exalt by praises the glory of His name ... The way to proceed to this seemed good to us: if some children, to whom we have previously taught a simple church song, sing in a high distinct voice, which the people listen attentively, following with their hearts what is sung by mouth, until little by little they become accustomed to sing a song together. But in order to avoid all confusion, it would be needful that you not permit that anyone by his insolence hold the holy congregation in derision, set about to disturb the order that will be established by this." Seeing that the ministers already asked the Genevan Council to keep order, the planning stage apparently had passed and a speedy realization of the singing was anticipated. The political circumstances and the disagreements about the administration of ecclesiastical discipline caused, however, turmoil in the city, resulting in the expulsion of Farel and Calvin. On September 8th, 1538 Calvin preaches his first sermon for the French refugees in Strasbourg. A few months later he publishes for them: AULCUN PSEALMES ET CANTIQUES MYS EN CHANT (Some rhymed Psalms and Hymns to be sung). The question how Calvin came in contact with the thirteen rhymed psalm versions of Clement Marot remains unanswered. That this was the first time that Marot's versifications were published with notated melody is certain. C'est bien force et constrainte etc. This melody we find back in the 1562 Psalter. There Beza takes the melody for his versification of Psalm 68. In that form the Psalm is considered to be one of the most popular and characteristic psalm of the whole Psalter. "Que Dieu se montre seulement" is the most typical of the Strasbourg music style. With its 92 notes it is the longest melody in the Genevan Psalter. In September of 1541 Calvin was called back to Geneva, and the next year another Psalm collection was published entitled; "LA FORME DES PRIERES ET CHANTZ ECCLESIASTIQUES" (The Form of Prayers and Eccle­siastical Songs). The book opens with an unsigned letter to the readers. Calvin is most certainly the author. Seven-eighths of it talks about the order of worship and the administration of the sacraments. The last paragraphs deal with the singing. In addition to the 13 Psalms of Marot, 5 by Calvin plus the Song of Simeon and the Ten Commandments taken from "Aulcuns Pseaulms", the "Ecclesiastical Songs" contained 17 new texts by Marot set to music. Of these melodies those for the Psalms 4, 5, 6, 7, 8, 13, 14, 19, 22, 24, 38, 104 and 115 were maintained in successive editions. Who was the composer of these tunes? Shortly before Calvin's return to Geneva a Parisian musician, Guillaurne Franc, arrived in the city. He received permission to open a "music-school". It was Franc's intention to teach the psalm tunes to the children. The "Ordonnance Ecclesiatiques" (Ecclesiastical Ordinances) of November 1541, which had just been formulated, contained an article which is very similar to the 1537 decision.It reads: "It will be desirable to introduce ecclesiastical songs in order to better incite the people to prayer and to the praise of God. To begin with the little children shall be taught, and then in the course of time the whole church will be able to follow." The publication of a new Psalter in 1543 containing CINQUANTE PSAUMES (Fifty Psalms), 20 of which were new. All 50 were now by Marot and each had their own melody. The 1542 letter of Calvin, now twice as long, was included. He deals at length with the value and function of singing in the worship service. The letter, dated: Geneva, June 10th, 1543, for some time to come was published in reissues of the Genevan Psalter. From this collection only the text edition has been preserved. It was printed in Geneva by Jean Gerard. The music edition has not (yet) been found. The content, however, is known from the reprints by the brothers Beringen at Lyon in 1548 and 1549. Since 1543 the singing by the gathered faithful (and not only by the children) was the rule. On a singing schedule all the 50 Psalms were divided over 17 weeks. During the Sunday worship services and the Wednesday prayer services all the Psalms in their entirety were sung in turn, each psalm to its own tune. The minister had to keep this schedule. This was the more reason for the printers to reproduce the psalms books, in order to sell them, faithfully. Of the new melodies of 1543, which in all probability were composed by Guillaume Franc, 16 we find back in the 1562 edition, either in their original form or slightly improved. They were the Psalms 18, 23, 32, 33, 37, 43, 50, 72, 79, 86, 91, 107, 118, 128, 138, the melody of the Ten Commandments and the Song of Simeon. Probability is not yet proof, therefore, we must leave the problem of attribution of these melodies to Franc open. What happened to the psalms of Calvin as they appeared in "La Forme des Prières"? They were all replaced by verses written by Marot. This could only be done, if not on the instigation of Calvin, then certainly with the permission of the Reformer. Certain similarities in the versification can only be coincidental. For proof that Marot kept Calvin's versification in mind, the first line of Psalm 91, the form of which is the same in both rhymings, is often given. Since the publication of the monumental book, "Clement Marot et le Psautier Huguenot” (Paris, 1878-'79) by Orentin Douen it has become customary to portray Marot, the "gracious man of the world" as the victim of Calvin, the "gloomy recluse". Nothing like that appears from contemporary documents. The fact that Calvin came between him and the Council of which he asked [awkward translation: intervened with the Council on Marot’s behalf, asking] "to render him some goods" in exchange for which Marot "would strive with all his might to complete the psalms of David", implicitly shows the praise for Marot's talents and his willingness. The Council answered: "that he must have patience" This only shows that the city was in dire financial straits, and not that there was any animosity towards the poet. It is significant that Calvin deliberated to entrust all the 150 psalms to Marot. Marot leaves Geneva at the end of 1545[=1543]. Guillaume Franc follows him soon, because he could not live on his meager salary. At that moment we meet for the first time the name LOYS BOURGEOYS, de PARIS, CHANTRE (Louis Bour­geois, of Paris, Precentor). The post formerly held by Franc is now divided between Guillaume Fabri and the newly arrived Loys Bourgeois: "to teach the children how to sing the psalms in church". Seeing that Fabri's work was not satisfactory, Bourgeois, "who was more suitable than he", became responsible for it from August 3rd on. From that date he fulfilled his duty skillfully and regularly, which may be concluded from the absence of any complaints in the Council's records. During his Geneva years Bourgeois composed psalm settings for amateurs. They were printed in Lyon by the Brothers Beringen (1547) who were equipped to do such printing, and not as it has been argued, to escape from Calvin's anathema ! For his students Bourgeois designed a musical primer entitled "Le droict chemin de musique" (The Right Road to Music) (1550). With the arrival of Theodore de Beza in October of 1548 a new phase in the completion of the Psalter begins. Although we do not know the precise date, the funeral oration of Caspar Laurent makes it clear that the above date is correct. By chance, it is said [= nice legend, but no factual evidence], Calvin discovered a rhyming of Psalm 16 on Beza's table - the first psalm [i.e. in numerical order] which Marot had not yet arranged. Beza himself confirms the role which Calvin played in it: "On the urgings of the great Dr. John Calvin, I have completed the rhyming of the psalm in French verses, begun by Clement Marot, undisputed prince of the French poets of his time". The first information about dates we can find in the preface to "Abraham Sacrifiant" (Abraham's Sacrifice [a play written by Beza]) dated October 1, 1550, in which Beza announces that after his drama he "hopes to continue with the rhyming of the psalms which at the moment I am working on." We do not know how fast or slow Beza worked; what we do know is that Calvin becomes impatient and insists that the psalms be sent to him, so that they can be set to music. As far as Bourgeois is concerned, he asked council for "a little wheat for the improvement of psalm singing." In between the lines of the vague reaction of the council's secretary, we can read that the request concerned the creation of new melodies for each psalm. For there were 34, with an equal number of new patterns, which Beza adds to the 49 of Marot. The new collection is publishing by Jean Crispin in the fall of 1551 with as title PSEAUMES OCTANTE TROIS (eighty-three Psalms). The expansion of the repertoire, divided over 25 weeks (instead of 17) renders the previous collections useless. Ten years would pass between the 83 psalms and the completion of the Psalter. Before any thought could be given to the completion of the remaining 67 psalms, the 83 psalms should become familiar. The rhyming of psalms would proceed in a slower pace. To the reissuethe printer added "six recently translated psalms" (1554) and a seventh was added in 1557. These texts, printed after the 83, neither had their own melody nor notated music. For the first time Beza resorts to a strophic form previously used and he refers the reader to the corresponding melody; consequently two psalms, sometimes more, are sung on the same melody. An examination of the 1562 collection shows that a whole series of similar psalms, which are treated in the same fashion, and thus are sung to a melody of another psalm: psalm 62 to 71, 76-78, 82, 95, 98, 100, 108, 109, 111, 117, 139, 140, 142 and 144; all together 25 psalms. Did Beza lack the fantasy to construct new strophe forms or was he afraid to overload the school and the faithful with too many new melodies? The explanation of this fundamental change could be the result of Bourgeois' departure. On March 21st, 1551 the salary of Bourgeois, along with those of most of the civic officials, was cut in half because of the state of finances in Geneva. Contrary to what has been written, this measure, which affected the precentor, had no connection with the "Advertissement" of December 15th of that year. For lack of money Bourgeois left Geneva in 1552 never to retum. Beza would have to do without the co-operation of a composer who had the real understanding of providing each psalm with a fitting tune. Even though the work of rhyming stagnated, the same cannot be said for the Genevan printers. The printing firms cleverly competed for customers and licenses. In 1539 [= 1559] the Council granted the precentor Pierre Vallette a license to print music in a manner that he had invented, for three years. That license Vallete handed over the next day to Jehan Bonnefoy, Michel Blanchier and Etienne Coret, all Geneva printers. In 1560 Pierre Davantès, nick-named Ante­signamus, in turn obtained a three year license for a "new type of music printing". On June 19th Antoine Reboul and Emery Bernhardt were empowered to print the psalms "with a new kind of music printing". On June 24th "Jean Rivery requested permission to print the psalms with the note names and scales at the beginning". On March 24, of the same year, however, a request, dated November 12th, by Jean Rivery, in which he asks to print the psalms "with annotations the unrhymed text and with a prayer at the end of each psalm", was denied, more so because" Mr. Beza will have the complete French Psalter printed presently". From that moment events follow each other in rapid succession. On June 30, 1561 the deacons, "entrusted with the care of the needy strangers, request council to give them the license of printing the psalms, for which Beza has given them the copyright. On the recommendation of Calvin they receive the license on July 8th for a period of ten years. So Calvin still saw to completion of the Psalter two years before his death. The undertaking which he had initiated had taken 22 years to complete. 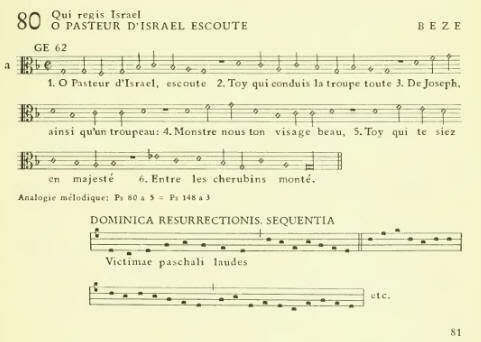 Bèza commissioned Gervais de la Court to copy (calligraphy) the psalms he had rhymed and ‘Maistre Pierre’ to notate the music of them, so that they could be sent to the court. When Bèza left Geneva on August 17th, to prepare for and take part in a religious discussion at Poissy, he took the manuscript along. On the thirtieth of August he wrote Calvin from Paris that he hoped to obtain the royal privilege shortly. After the Parisian theologians declared on October 16th that they "had found nothing in them that is in conflict with our catholic faith, but rather that it is in keeping with the Hebrew truth", privilege was given on October the 19th and confirmed on December 26th, 1561; in detail it states that the psalms "are translated according to the Hebrew truth, in French rhyme and are set to good music, as has been observed and recognized by men, learned in the holy Scriptures and the above mentioned languages and also in the art of music". It would be odd, if the melodies were not judged by Thomas Champion, organist of the royal family, and himself a composer of psalm settings which were sung at the court. Charles IX called him "our dear friend". The examined manuscript began "with Psalm 48, where it reads "C' est en sa tressaincte cite" (It is in his most holy city) and continues to the last line of psalm 150 "Chante a jamais son empire" (Sing forever in his Realm). Only the last Psalms, which Bèza had recently completed, and the only ones which could be protected by privilege against unlawful printing, were scrutinized by the theologians. It is important to note that the melodies of these psalms were also judged as good by music experts. They are 40 in number, all of which were included unchanged in successive editions. They are the melodies of Psalms 48, 49, 52, 54 to 61, 75, 80, 81, 83-85, 87-89, 92-94, 96, 97, 99, 102, 105, 106, 112, 116, 135, 136, 141, 145, 146-150. Who is the composer of this important musical contribution? The man who continued the work of Bourgeois became the subject of severe criticism by Douen, whose judgment heavily influenced many generations of musicians. They, without further ado, made the "verba magistri" (the words of the master) their own. If one is to believe Douen, then the melodies of 1562 [warning: Pidoux lengthily quotes Douen but does not share his opinion] "are for the most part unworthy.of a man of good taste. The musician who undertook to set Bèza's psalms to music was clearly inferior to Bourgeois, when it comes to fruitfulness as well as talent. For the 62 psalms he only could find 42 melodies, furthermore it must be said that only six of them (61, 74, 84, 88, 89 and 92) have an uneven but indisputable value. Except the melodies we have indicated, the remaining ones are average or not suited to words or even trivial, without style or rhythm, and barely singable. For the rest we are comforted by saying that the name of the musician, without taste and with so little dedication, in part deserves the oblivion in which he finds himself." One thing Douen saw correctly: the composer of the music of the last psalms must indeed be sought in Geneva and in Bèza's circle. That leaves none other than Pierre Davantès, nicknamed Antesignanus, from Rabasteins in Bigotre, who became a citizen of Geneva on March 6th, 1559. Davantès had acquired a good reputation for his Greek and Latin publications. On May 24th, 1560 he received a privilege for publishing the psalms "with a new type of music print" or, as the title indicates, "a new and easier method to sing each psalm stanza without having to refer to the first stanza, as we are accustomed to do in church." Davantès, according to Bayle, a man of the world, was in his work a most persistent man as one could ever imagine. Based on a three-volume dissertation about Terentius, he proposes a three-layered notation of the psalm tunes. He printed the notes, preceded by the note names, as Vallette had done and added a third notation of his own invention: a clever code, based on numbers, preceded or followed by the usual signs, which provided the opportunity to read the melody insolfège, while other signs placed underneath them determined the note length and the rests. By means of this third procedure it became possible to notate the melody with all the stanzas. This shorthand, however, apart from the problems for the printers, demanded the constant attention of the singer. This attempt, which gained no followers, gives evidence of an interested and methodical mind and at the same time is the fruit of a lengthy musical practice. Davantès also printed the unrhymed bible text alongside the rhymed version. As Hebraist he was much interested in the psalm superscripts and they were included in his Psalter, e.g. Psalm 5 "For the director of music. For flutes". Would it be possible that the melodies of 1562 are the work of Davantès? It would then be necessary that they give evidence of the same maturity which his literary works show; that they are written with the same dedicated care which he applied in the working out of his notation system. It would be inconceivable that the thoughtful, patient and precise author would allow himself to be sloppy and negligent while composing melodies for ecclesiastical use. The composer is thoroughly at home in polyphony, which is apparent from certain melodic fragments that can be combined like invertible counterpoint. A typical example of this is, Psalm 99, which is the contrapunctus of Psalm 47 by Bourgeois. See also Psalm 54 the first and the last lines which may be combined with the fourth one; and Psalm 89 line 5 against 4. Also some of the psalms of 1562 are inspired by the old repertoire: Psalm 55 is closely related to the hymn "Lauda Sion Salvatorem", Psalm 58 is reminiscent of the Credo III. Psalm 141 is a remarkable transcription of the hymn "Conditor alme siderum", and the melody of the sequence "Victimae paschali laudes" forms the basis for psalm 80 [see remark above]. By means of notes - as the Biblia pauperum did by means of pictures - the Christian Easter is connected with the Jewish Passover, an inspiration which can only come to an author who is equally at home in musical composition as in the convolutions of Biblical exegesis. fol. 58. Extra expenses for the month of June 1561 to Mr. De La Court for the copying of Mr. De Bèza psalms in order to send them to the courts: 12 fl. 6 st.; to himself for the copying of the privilege for said psalms: 8 st.
fol. 58. back. To Maistre Pierre for putting the psalms to music: 10 fl. fol. 59 front. Extra expenses for the poor in the month of July, 1561. Paid to Mr. De Bèza for what he has given to the precentor Maistre Pierre for putting the psalms to music in addition to the above mentioned gains 20 fl., 5 st. Since the completion of the Psalter was of interest to the Church as well as to the City, why did the payment to Bèza's co-workers come from general revenue [from the Hôpital, and not from the City Council]? The increased amount paid to Maistre Pierre is not related to his regular salary, even less to the incidental allowances in cash or in wheat, which council gave its precentors. [...] Why are these acts directly dealt with by Bèza and the treasurer of the Hôpital, without a trace of it in the deliberation of the council or in the registry of the ministry of the pastors? It is as if Bèza had only personal obligations and took care of matters on his own initiative. 1. Tetrachords are the two halves of modes which are exactly similar in the order of tones and semitones. For example, the two tetrachords in the Dorian mode are: D-E-F-G and A-B-C-D.
2. A hexachord is a group of six consecutive notes which are regarded as one unit. Hexachords are used from the 11th to the 17th century for the purpose of sightsing - not unlike the movable doh system today. There were three hexachords: hexachordum natu­rale, starting on C, the hexachordum ?none, starting on F, and the hexachordum durum, starting on G. It will be observed that the three hexachords overlapped in range, and a singer would have to pass from one hexachord to another. This shifting between hexa­chords was called mutation. 3. A sequence is a type of hymn which found its origin in the interpolation in some of the musical elements of the mediaeval liturgy. The sequence (from sequi=to follow) used to follow the Gradual and Alleluia, and typically was melismatic: many notes were set to only one syllable. The resulting melody was subsequently set to different words in syllabic fashion: one note per syllable. Thus the Sequence evolved as an independent hymn, which became especially popular in the 11th and 12th century.